Through our in-house LEED Accredited Professionals, Design Build Concepts is proud to offer LEED Certification as a way to ensure every detail of your building is considered and documented in context with its relationship to the environment. In addition to LEED Certification, DBC can also work with you to develop alternative, and often less costly, green building solutions to both minimize long-term energy costs and be a good steward to the environment. From material selections to architectural elements, DBC has the expertise to maximize your dollars while minimizing your carbon footprint. 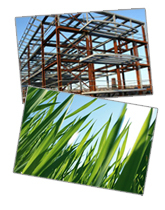 DBC's parent company, IBT Holdings, LLC, is a member of the US Green Building Council (USGBC).